A Twitter chat is a way for Twitter users to gather together at the same time and talk about a particular topic. In this case, we’re moms who have IBD and we want to discuss how to be healthy enough for pregnancy. By searching for, or clicking on, the hashtag, #IBDMoms, you can follow along with all the posts using that tag. In this way, you can see the conversation and also take part. If you want a reminder about the time, you can respond to this Facebook event, and it’ll take care of that for you! The hosts of a Twitter chat will pose various questions, preceded by “Q1,” “Q2,’ and so on. You can respond by either replying or retweeting the question and beginning your answer with “A1,” “A2,” and so forth. This helps the hosts and other attendees to know which question you’re answering. 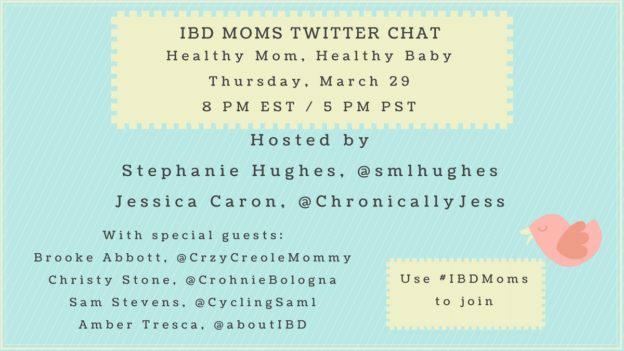 Putting the chat hashtag, in this case, #IBDMoms, in the Tweet will also help everyone to see your Tweet. If you forget either of these things, no worries! The hosts and #IBDMoms special guests can help by retweeting your Tweet with the hashtag, or answering your Tweet. It does seem strange, almost like walking up to a group of people and joining in the conversation. But it’s OK! You are welcome to join in at any time! You’re also welcome to follow along and read the conversation, even if you’re not moved to answer any of the questions. Tweeting at the host and letting them know you’re around, though, is a great way to make sure they know you’re interested and they can help you if you need it. Here’s the beauty of it! You can come in at any time after the chat and continue to take part in the conversation. The hosts aren’t going anywhere, they’ll see your responses the next time they log in and the conversation can continue. I hope to see you in the Twitterverse! I’m looking forward to this topic, I know it’s going to be so informative because we have moms with IBD who had babies in all different ways and in all different circumstances! This entry was posted in IBD Moms, Twitter Chats on March 27, 2018 by Amber.